The following bus routes alight at Broadway Shopping Centre: 9, 10, 27, 33, 419, 72, H91, 190, 211, 220, 267, 283, 295 and 391. Please see www.tfl.gov.uk to plan your journey. The Hammersmith & City Line tube station is located across the main road (A219) and the District & Piccadilly lines also stop at the Shopping Centre. Both stations are wheelchair accessible. The centre is spread out predominantly on the ground floor and accessible to wheel chair users at all times. 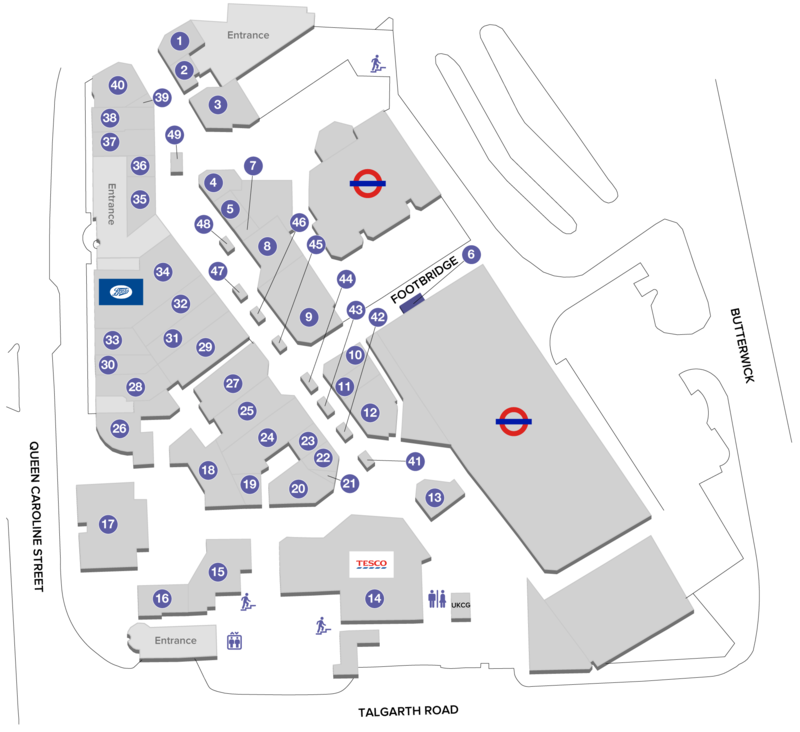 There are ramps available from street level at the front and to access the Bradomre Square food court by Queen Caroline Street or the Talgarth Road leading towards the Eventim Apollo theatre. We also have two scenic lifts in the middle of the Shopping Centre to help people with limited mobility up to the upper level Bus station situated on the first floor. Toilets are located at the southern end of the mall on ground level, adjacent to Tesco. A charge of 50p is levied. Lloyds Bank cash machines are located on the ground level next to London Underground. Also, free of charge machines are located within Sainsbury’s, Wilko and Metro Bank. Passenger lifts for access to other levels are available in the Mall and Car Park. There are two photo booths located by the entrance to the public toilets and the car park corridor. The current vending charge is £5. Our security officers are fully trained First Aiders. The Centre has an Automated External Defibrillator (AED) on site. The UCKG HelpCentre is open everyday and committed to supporting and improving the lives of those in our community. Our daily prayer meetings and motivational seminars focusing on specific areas of life provides you with clear and practical tools to resolve problems and to achieve and maintain a stable and fulfilled life. Our dedicated team of Pastors and volunteers are also available in-between meetings to provide advice and guidance on a one-to-one or family/group basis, with all our services available free of charge! It doesn’t stop there… We also operate community groups that assist youths, the elderly, single parents and others locally. We conduct visits to local hospitals and prison services to offer support and assist in alleviating the pain of those suffering. We are here for you. We fight your problems with you and are beside you every step of the way. You do not have to feel alone.